In this article, we have put together the best PowerPoint templates you can use for your presentations. When you are getting ready for a big presentation, do you want to inform your audience or wow them? 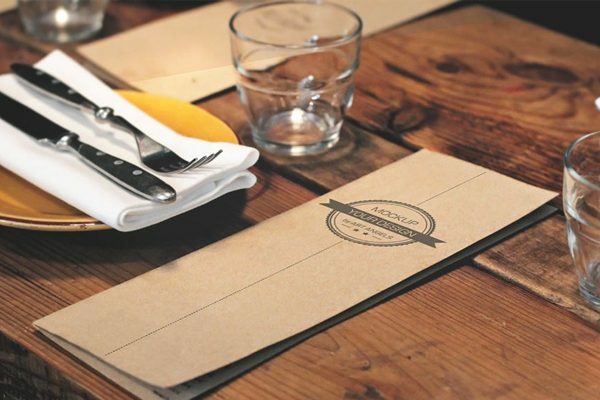 The best way to make a great first impression is to get creative. In a presentation, even though the information you are presenting is important, presentation and visual appeal also play a huge part on the feedback you’ll get from the audience. 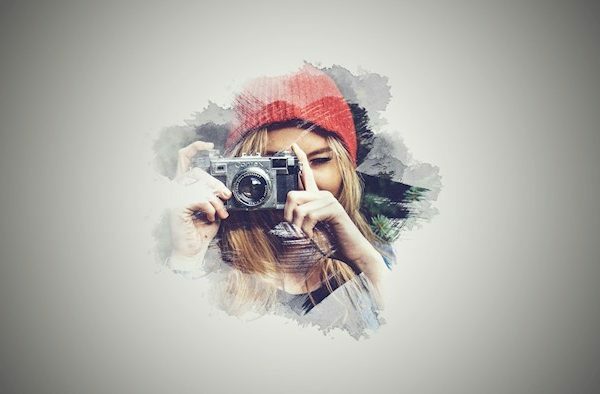 So, we have provided for you 25 of the Best Powerpoint Template of 2018 to not only impress your audience but also receive that positive feedback from your audience. Powerpoint is created by Microsoft, which is a collection of slides that contain information and data needed to be informed to an audience. These slides have a different layout to help you organize your information. 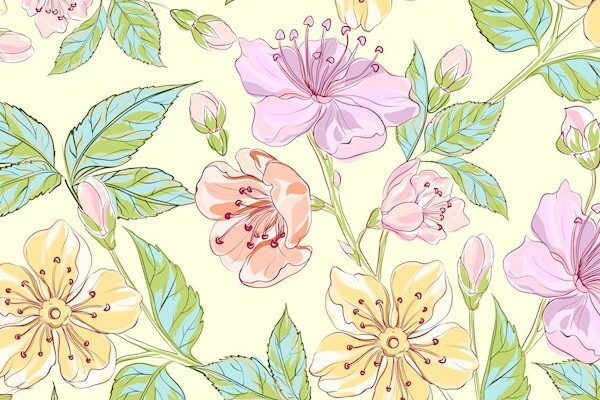 What we have provided for you are templates to use for Powerpoint presentation. A Powerpoint Template is a blueprint of the slides you are going to customize to create your presentation. 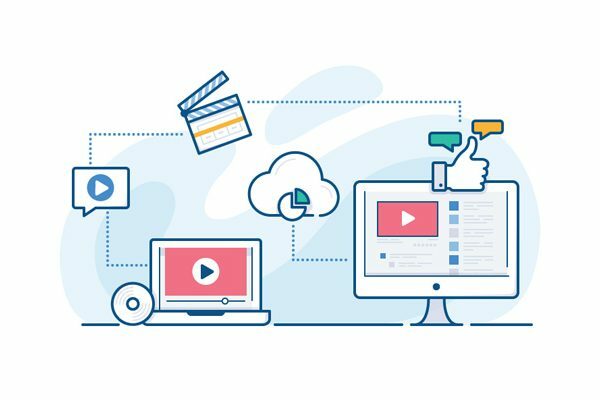 These PPT templates contain unique layouts that will make your information stand out. As a result, your audience will get a clear message and will be focused on what you are presenting. Each template as unique as every presentation that is given. In addition, Powerpoint templates also provide you with an outline of what information you may need to present. 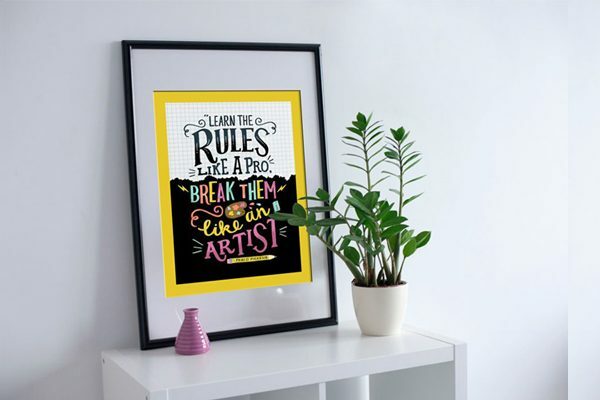 So, don’t stress yourself when you can have a professional and creative presentation in minutes. 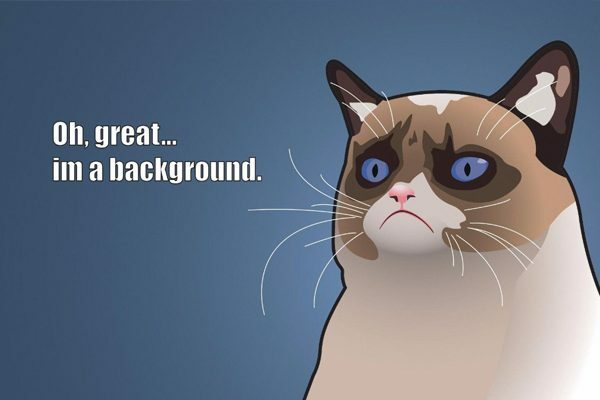 There are many benefits of using Powerpoint templates. Not only do you have to focus on gathering information, but creating an impressive presentation can be stressful. Many Powerpoint graphics designer, professionally design the slides to help you visually impress your audience. When you use a template, all you have to do is find a design that best matches your topic, and adds your information. 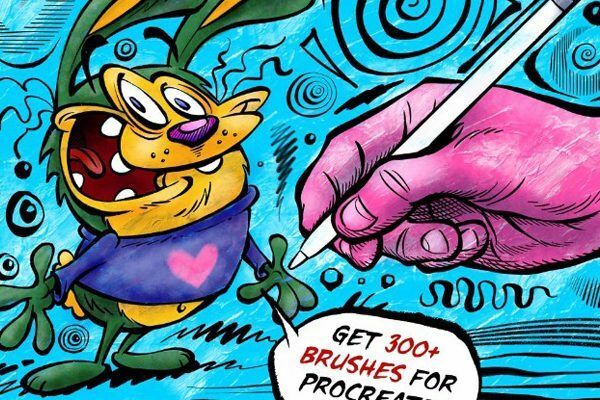 As a result, you save yourself a lot of time and your final work will be professionally done. 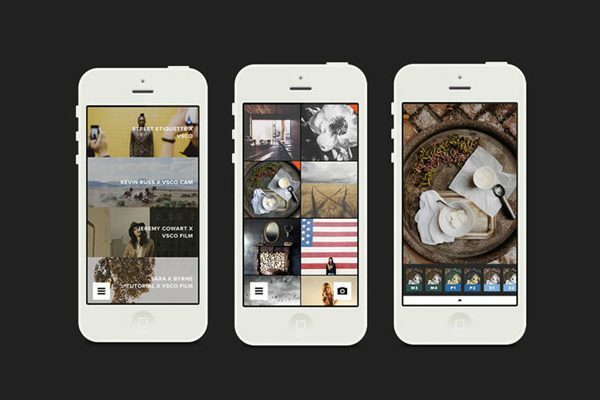 Designers know exactly to organize the slide layouts in order to keep the audience focused and intrigued with what your presenting. Also, people who use this for business purposes can help explain and analyze data. 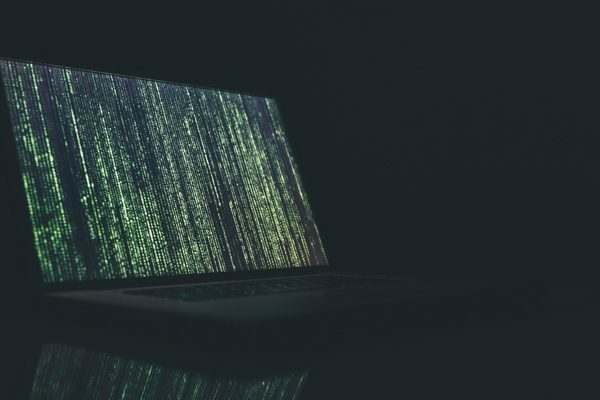 When presenting data in a public setting, the audience has a chance to ask questions and get answers at the moment, giving them a clean and understanding message. If you are looking for a visually appealing presentation template, then the perfect template is Clean. 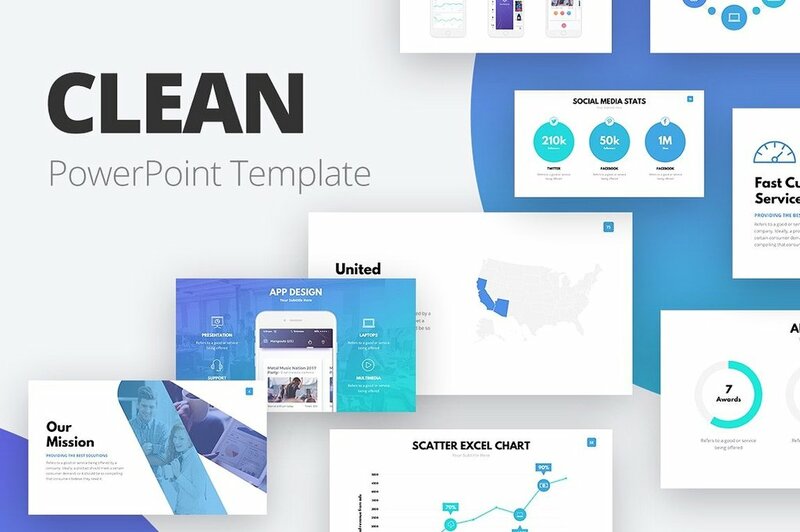 Clean Powerpoint Template modern presentation template composed of 105 slides. 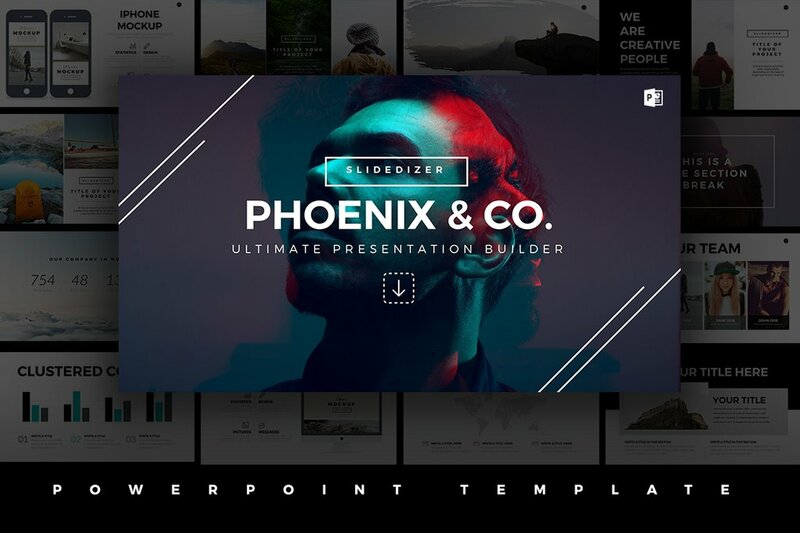 This presentation template will deliver a simple, yet powerful and stunning presentation. 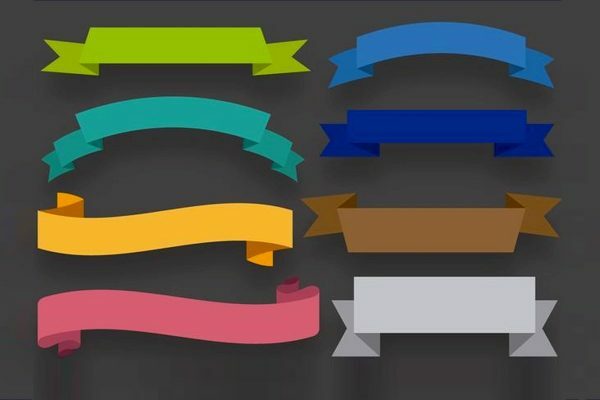 Because of the cool colors used throughout the slides, your information will stand out, giving your audience a clear and understanding message. Simplicity is always the best way to present information. Neue Minimal is the perfect template for a simple and modern look. 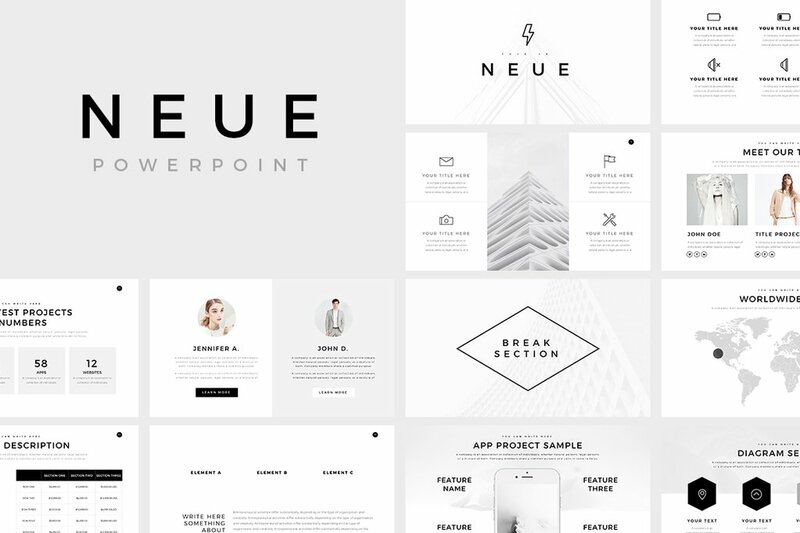 Even though its a black and white presentation, this template is designed to give an elegant and sophisticated look to your presentation. This presentation includes more than 100 slides, giving you enough room to add all your information. Because of the minimal style, your slides will be short, sweet, and to the point, but you will still be able to give all your information to your audience without overwhelming them with information in one slide. Pitch decks are a brief presentation to give your audience a quick summary of the business and mentioning future plans and ideas. Since Pitch Decks are mostly for potential investors, founders of the company, customers, and partners, you want a presentation that will not only make you stand out, but that will also represent your business or company. 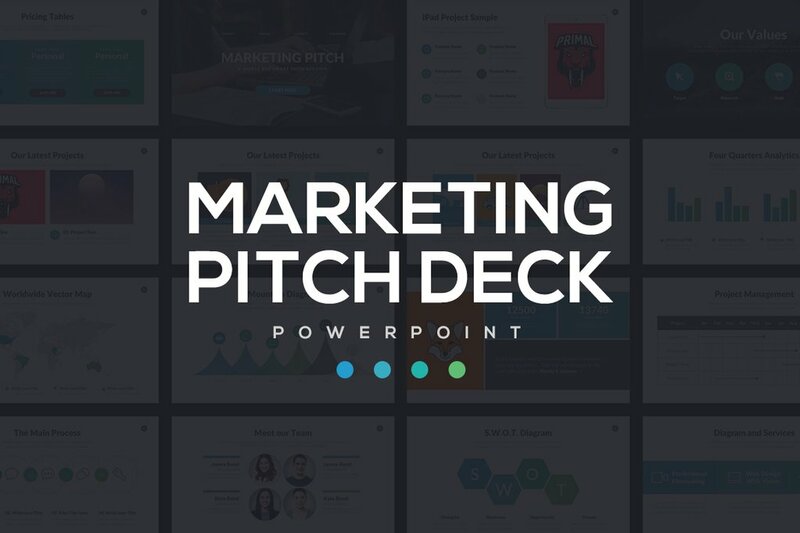 Marketing Pitch Deck Powerpoint Template is the best presentation to stand out, and make an influential presentation. Are you creating a presentation to present future objectives and strategies to achieve your business’s goals? Sounds like you are creating a business plan. 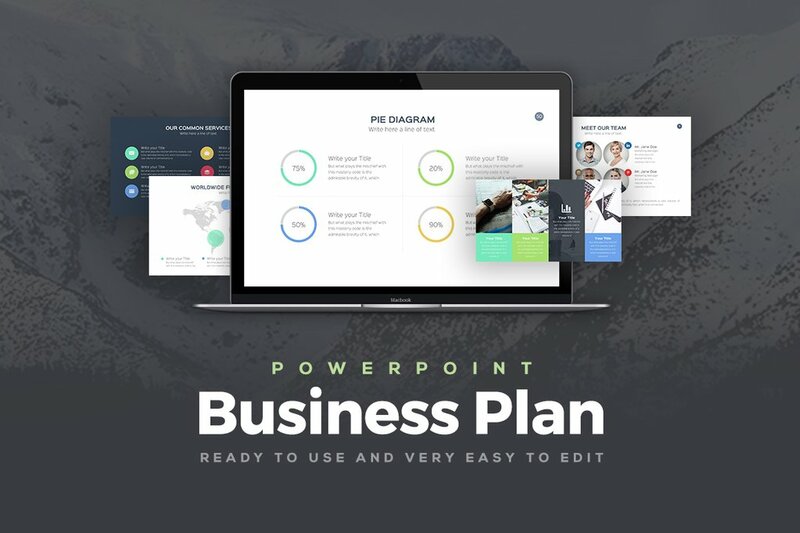 Good news, the Business Plan Powerpoint Template is an impressive presentation template that will make your information and plans stand out. 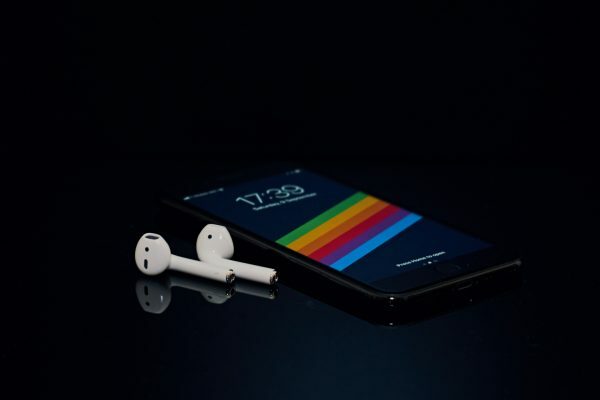 Your audience will give you their undivided attention, making this presentation successful since you will be able to give an eye-catching and influential presentation. 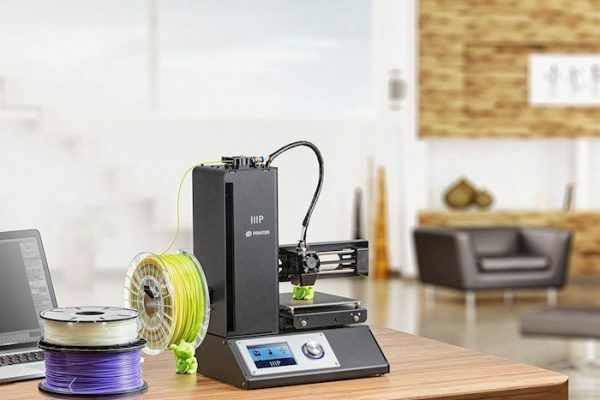 Innovation is defined as a change to make a more effective process, product, or idea. In business, innovations normally earn the company more business, making it more successful. 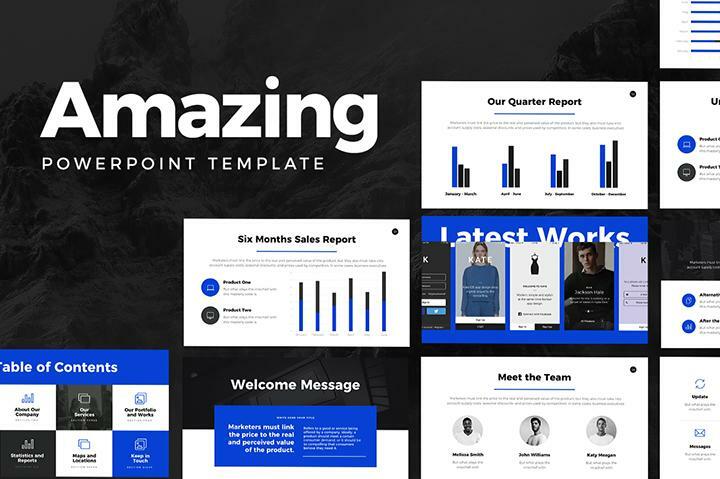 What better way to explain and inform your workers and co-workers of positive changes than to present them with an outstanding presentation template. 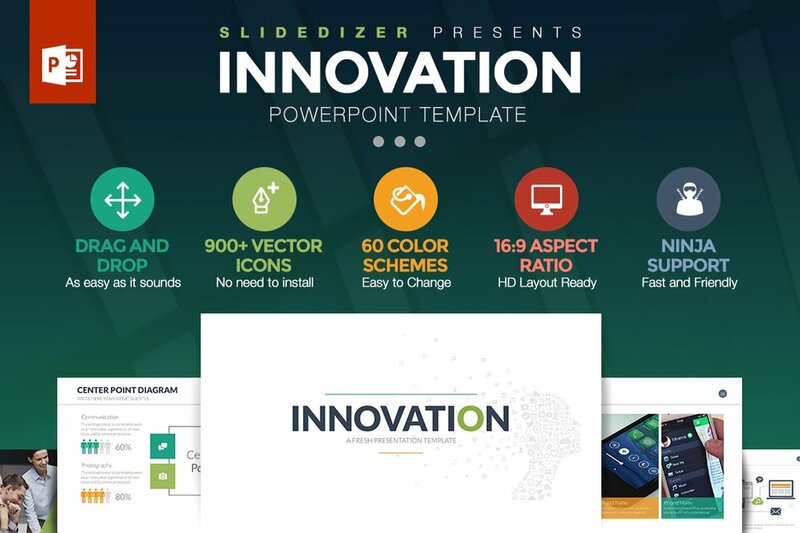 Innovation Powerpoint is very trendy, yet very professional powerpoint presentation that will capture your audience’s attention with its colors and unique layout. Investors are important to any company or business because they are the one who put money into financial schemes or help provide the property for your business. An investor with help you financially or however your business needs it as long as they see there is a profit there. 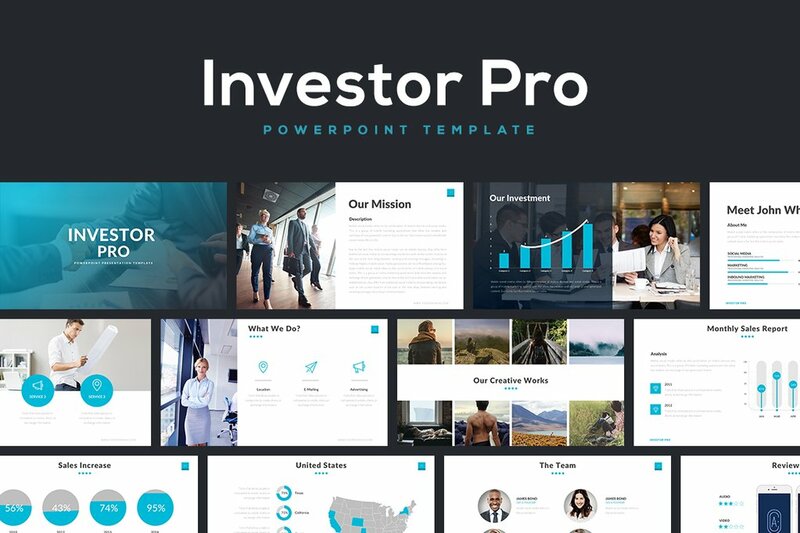 So, keep your investors up to date with your business by using the Investor Pro Powerpoint Template. This presentation template will impress your investors, demonstrating your professionalism and executing your information in a clean and straightforward layout. 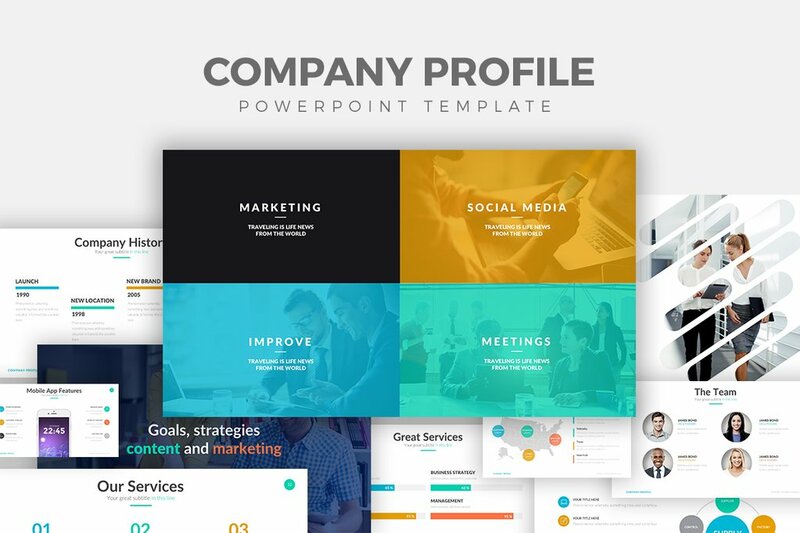 If you’re creating a company profile, then used the Company Profile Powerpoint Template. In fact, it’s not a hard decision for what template to use. 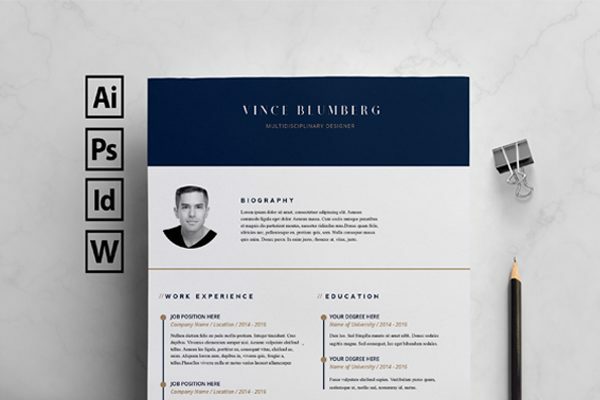 This presentation template has everything you will need to create the perfect company profile. IThis template is fully customizable, so all you need to do is add Infomation like the business history, values, mission, goals, meet the team and so much more. 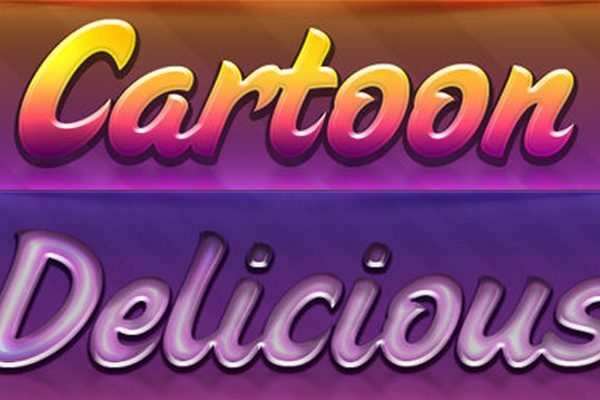 The title of this presentation template says it all. 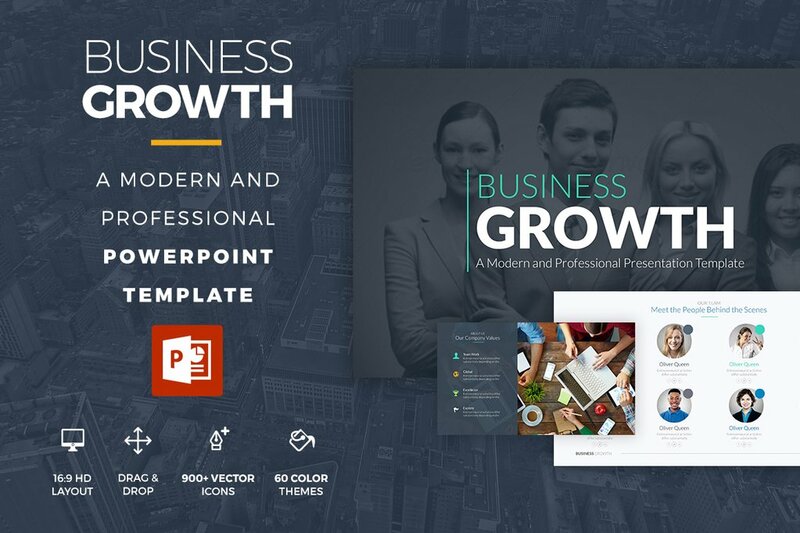 The Amazing Powerpoint Template is designed to save you time in creating a presentation that will help you stand out. 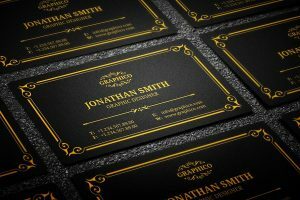 Whether you are presenting a school project, a business overview, or a company report, leave a lasting impression using bold colors to make your information stand out. What is marketing? Well, that is defined by everything around us. Marketing is promoting, selling products, or offering services. So, summing it down to one-word, advertising. A marketing plan describes the business’s activities of marketing objectives within a certain time frame. 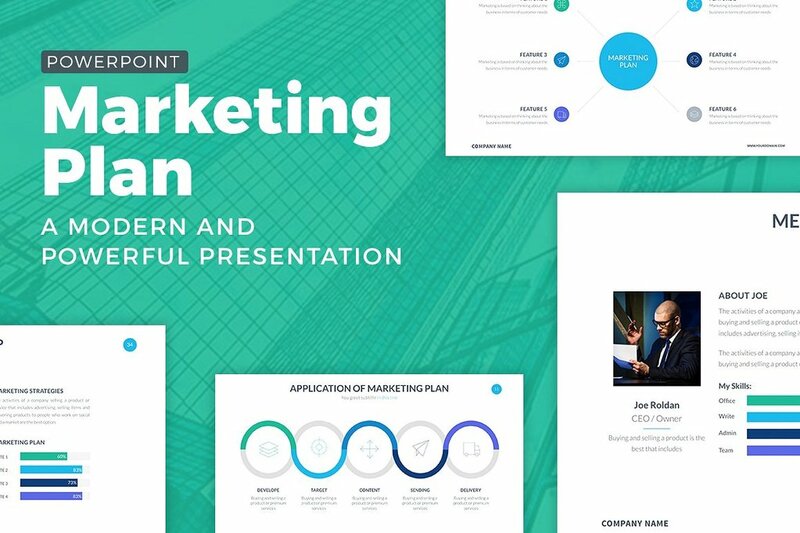 The Marketing Plan Powerpoint Template is the perfect presentation template to create all your marketing information such as target market, values, goals, budgets, planning, and much more. 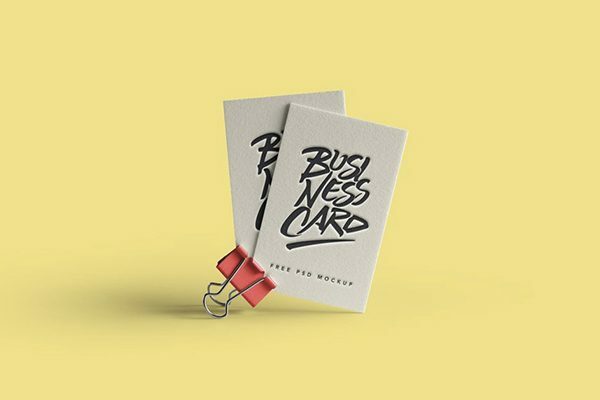 If you are looking for a presentation template to show-off how success, then the perfect template for you is Business Growth. 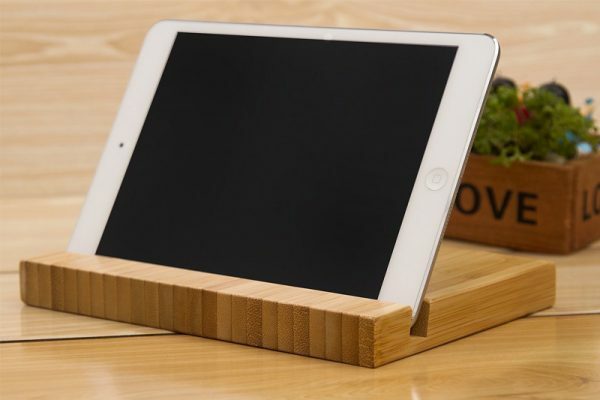 When you are presenting to an audience of prospective investors or customers, you want to inform them how well your business is doing, meaning that you are having positive feedback. 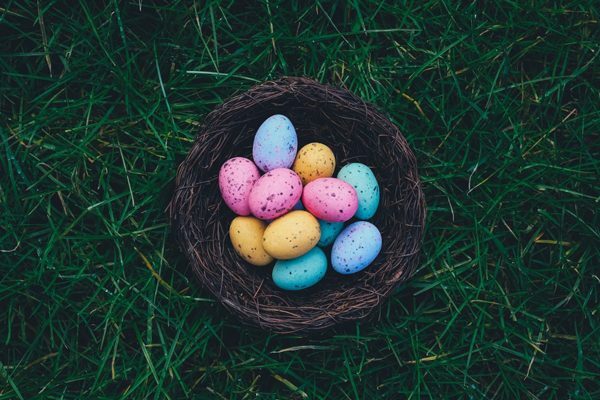 Growth in a company means that the business is generating positive earnings, which increases profits, meaning they can have an opportunity to get reinvested meaning they can expand. You are provided with more than colorful and ready to use slides, to create an impressive presentation. Presenting a pitch deck can be nerve-wracking. Not only do you have to focus on and gather all the information you need to inform, but create also having to create a presentation can stressful. You could always create your own presentation and stress more with the deadline coming up. 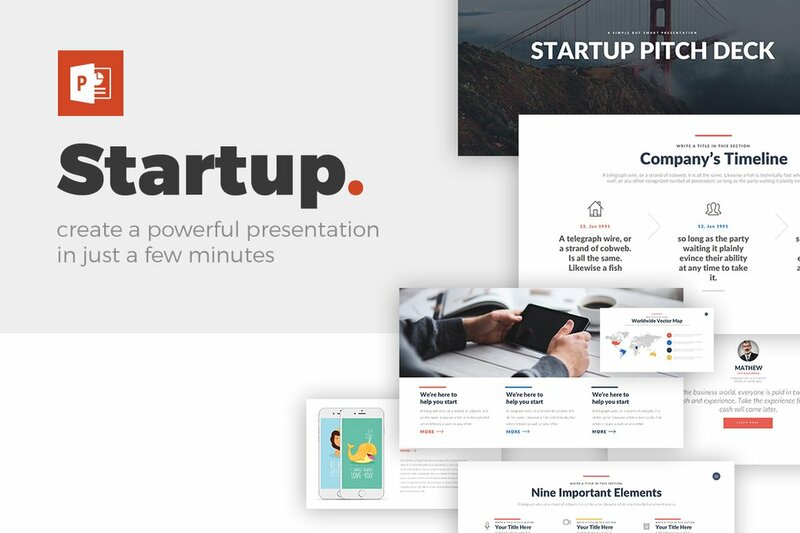 Or, you could just use the impressive Startup Pitch Deck, that won’t only present your information, but will capture the audience’s attention with its organized and colorful slides presentation that enhances the audience’s attention. 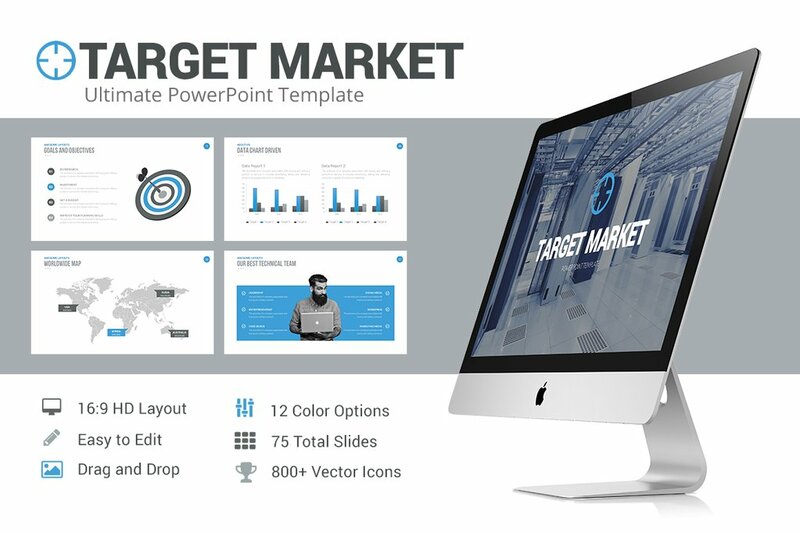 Target Market is a clean and creative Powerpoint presentation that will capture audience’s attention with the electric blue color used, that stands out on the white slides. Target market, in business, is a group of consumers for which a product or service is aimed at. 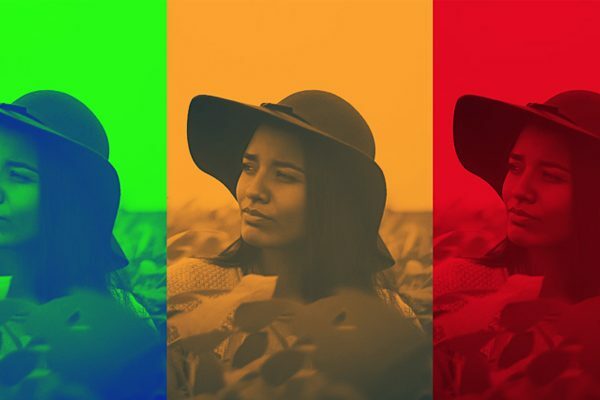 This presentation template allows you to change the color if you want it to match your theme of presentation or business color. Your information would be organized, making it easier for your viewers to follow along and get a clear message. 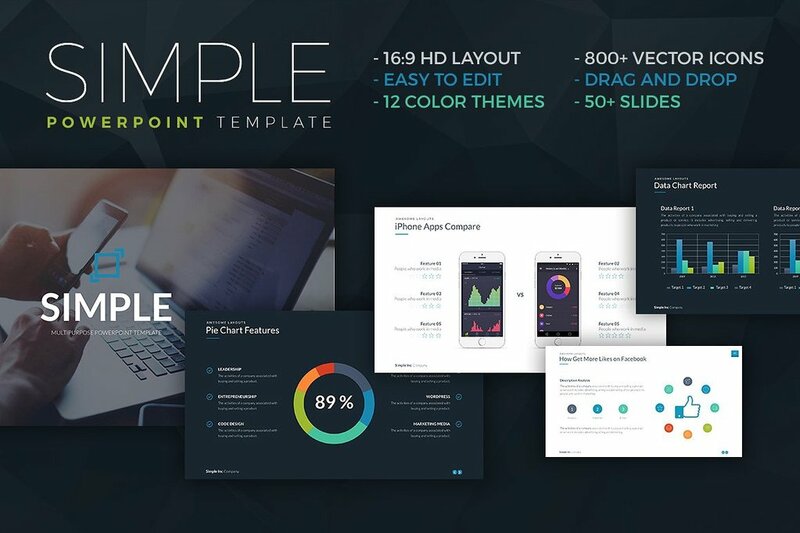 If you want to create an effective Powerpoint presentation, then the Simple and Modern Powerpoint Template is the template to help you create a powerful presentation template. 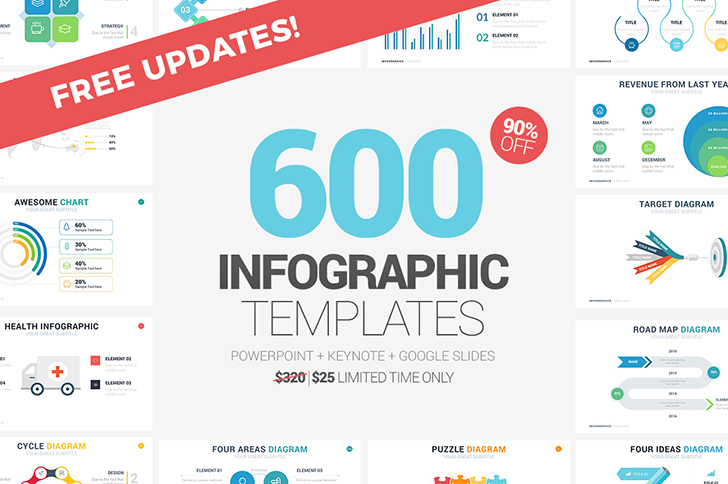 The template consists of 60 unique slides that are full of color, making the information stand out. Just because this presentation is simple it does not mean it is boring. 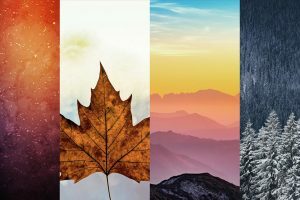 Apart from the colors being used, this presentation template is straightforward and will give your audience a creative presentation that is visually appealing. Like in life, you don’t want to stay where you are, you always want to keep moving forward to the next level. 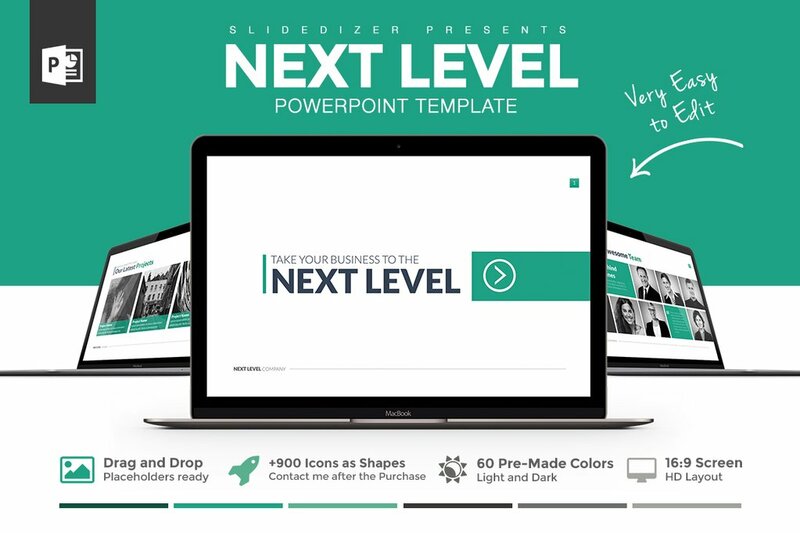 In fact, Next Level Powerpoint Template will help you achieve just that, with an impressive, powerful, and professional presentation template. This presentation template is designed to make your information stand out, letting you add visual aids to enhance your audience’s attention to your presentation. A trend is a defined as a general direction in which something is changing or developing in. Because this is a trendy powerpoint template, it was designed in a popular way people according to how people like to present their work. 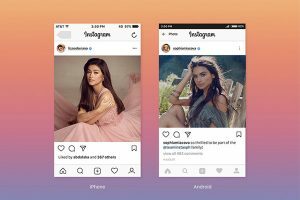 It may look simply because of the white background, but since it has another color on the slides, it helps to catch the reader’s eyes enhancing their attention to the information being presented. 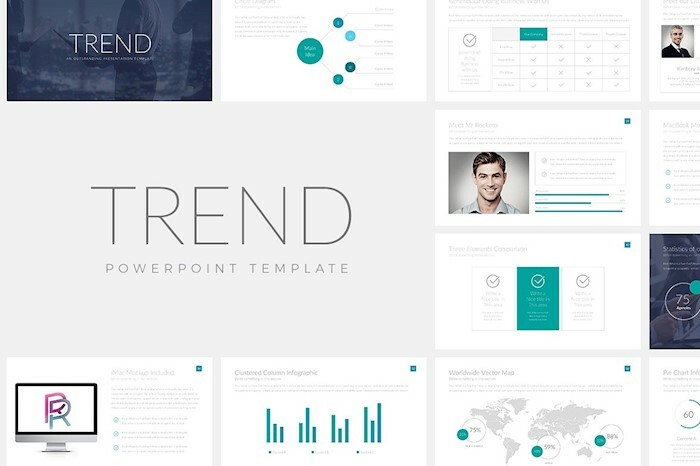 So, create a powerful presentation, and impress your audience using the Trend Powerpoint Template. 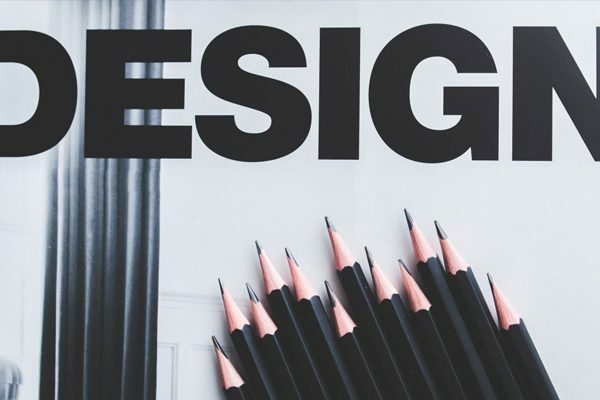 Branding is used in marketing to create a name, symbol, or design, that identifies with product or business. For example, the checkmark brand is the symbol known to be Nike, and the big yellow “M” is known to be the symbol McDonald’s. So, draw awareness to your presentation, as branding does. 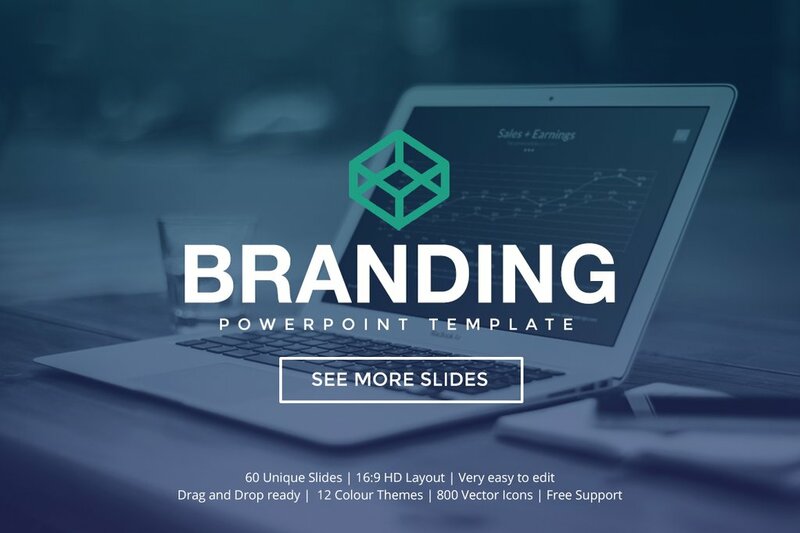 Use the Branding Powerpoint Template to visually capture your audience’s attention and give them a presentation that will be hard to forget. 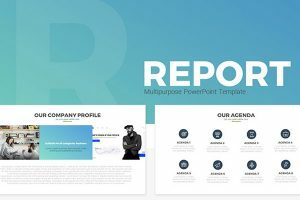 If you are looking for a minimal presentation template that is powerful and elegant, then you have found your Powerpoint template. Ghost is a simple and modern presentation template that provides you with more than 100 unique slides with a minimal style. 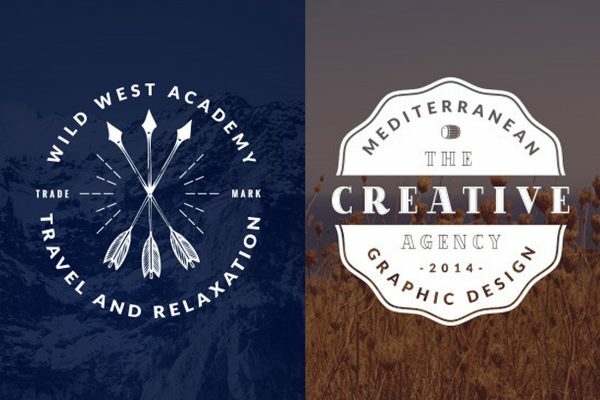 Minimal style is a great way to present to your audience because it keeps your slide, short, sweet, and to the point. Sometimes, adding too much information on a slide can overwhelm the reader, resulting in them losing focus, getting distracted, and not paying attention. 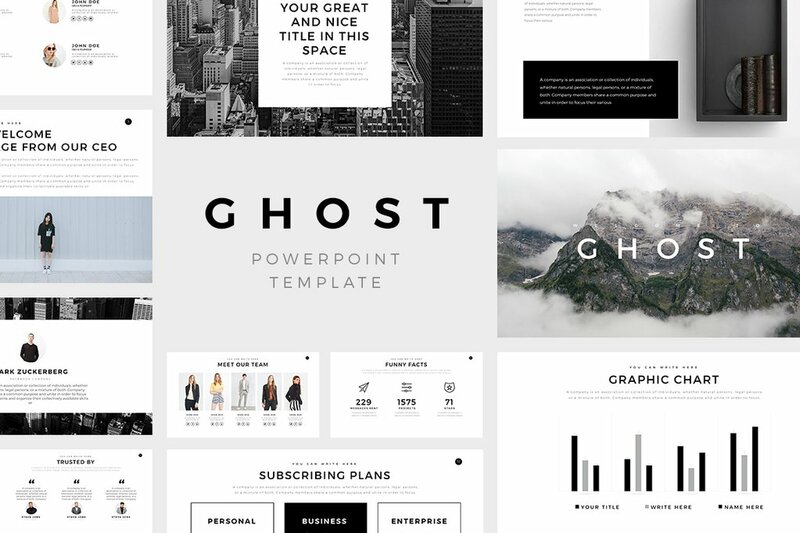 So, create an impressive presentation using Ghost Powerpoint Template. Fun fact: Impreza is derived from the Italian word, impresa, which means achievement. Wow your audience with a presentation template that demonstrates your creativity and determination to succeed. 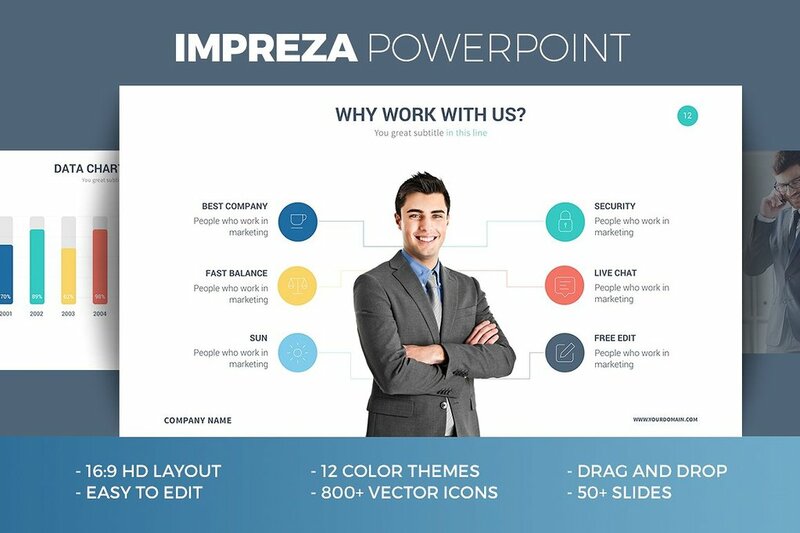 This presentation template is composed of 52 unique slides, with 12 color schemes, and 2 versions of the presentation. 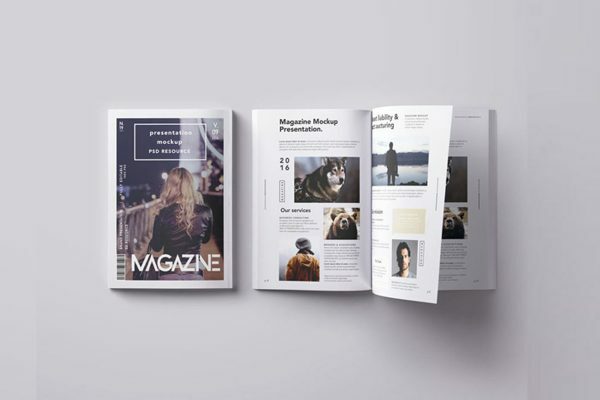 This template is fully customizable to help you achieve the look you want to present a one of kind presentation to your audience. Use the Impreza Powerpoint Template and present your information in a clean, professional, and creative way. 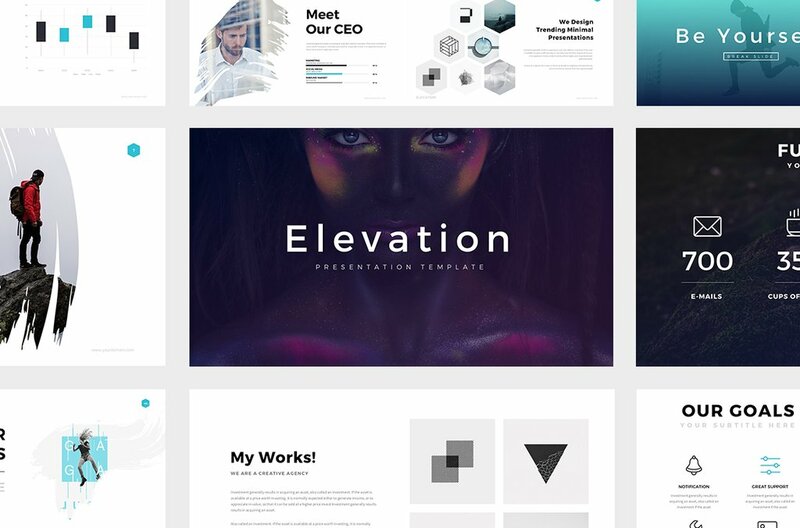 With more than 105 unique and creative slides that are based on a Master Slide, Elevation Powerpoint Template makes it easier for you to edit and fully customize. 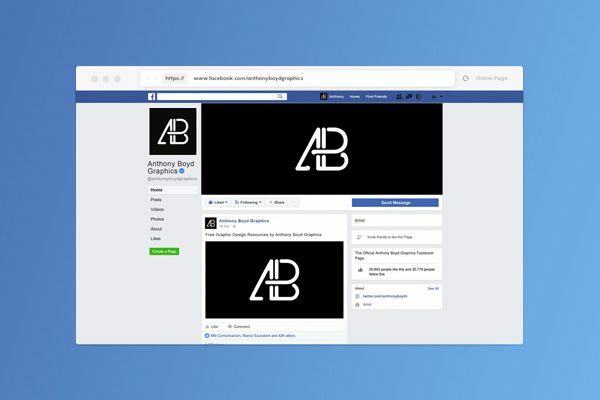 This presentation template is clean and straightforward giving you a minimal style. 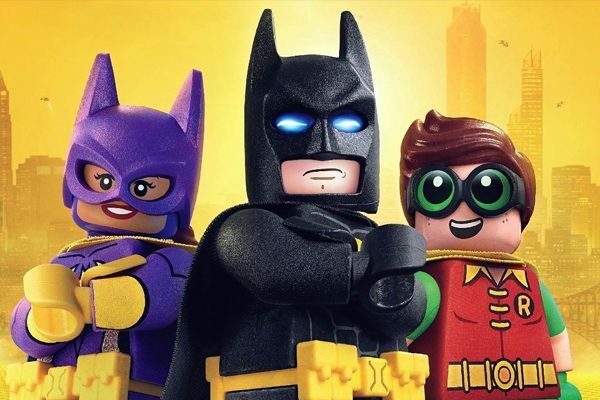 Because of the minimal style, you can add visuals such images to enhance the audience attention. Also, you can add infographics to show data to make it visually appealing. 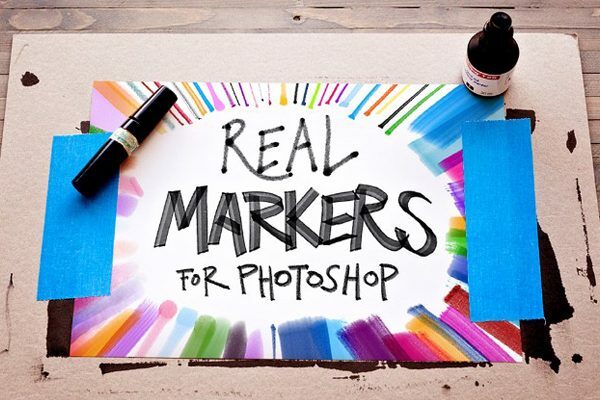 In addition, to being able to add any of the 450 vector icons provided to make important points and information stand out. Having a strategy on how to get where you want to in business is important. What kind of strategizing does a business need? Well, when you start a business you must plan ahead and see where you want to be in the future. From there you need a plan to achieve your goal, to be able to achieve that goal and grow your business. 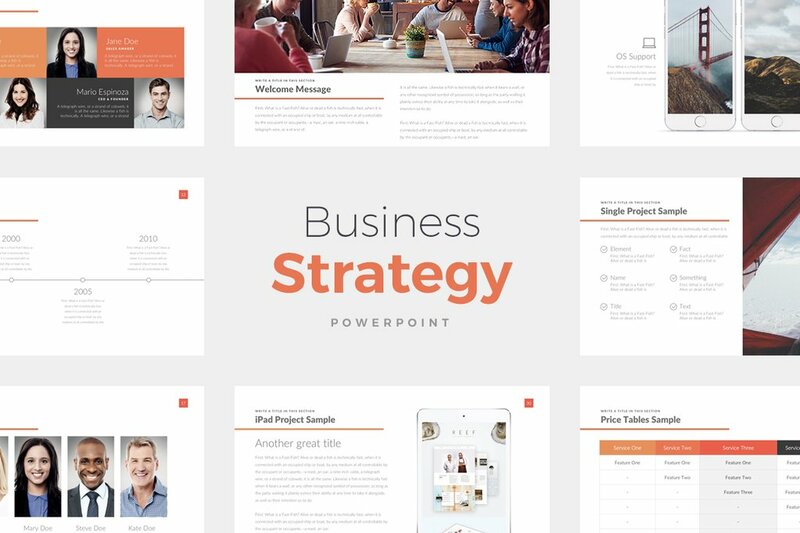 The Business Strategy Powerpoint Template will let you present your information in a clean and organized way. In fact, some important information would be how to prioritize objectives, competition, and financial information. This will give your audience a clean and clear message of what needs to be done. 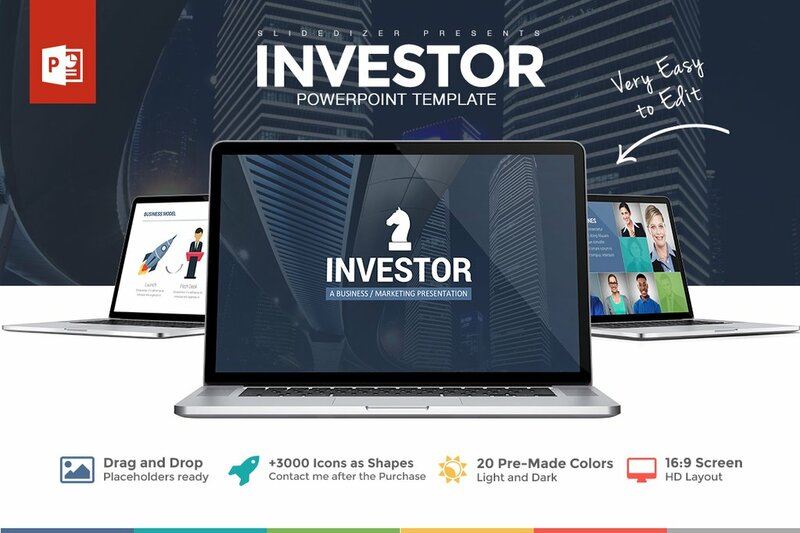 The Investment Pitch Deck Powerpoint is an outstanding presentation template if you want to convince an investor to invest in your project, business, or company. 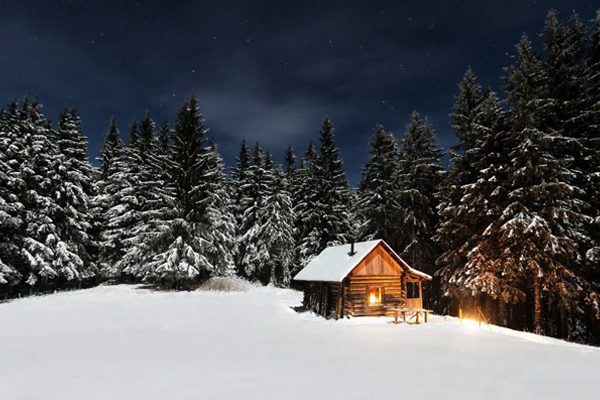 Demonstrate to your investor just how committed and determined you are to grow your business you have been building. 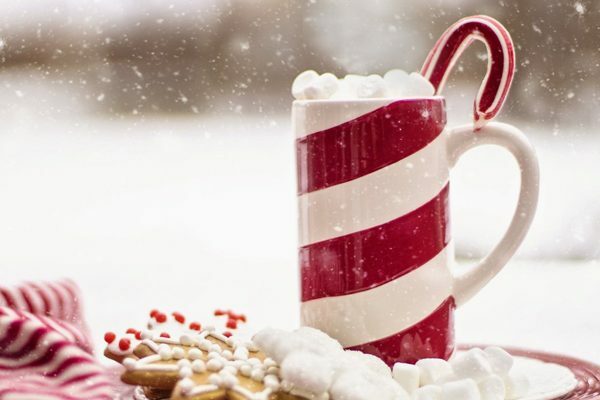 You can only make one first impression, so leave your audience with a positive a lasting impression. 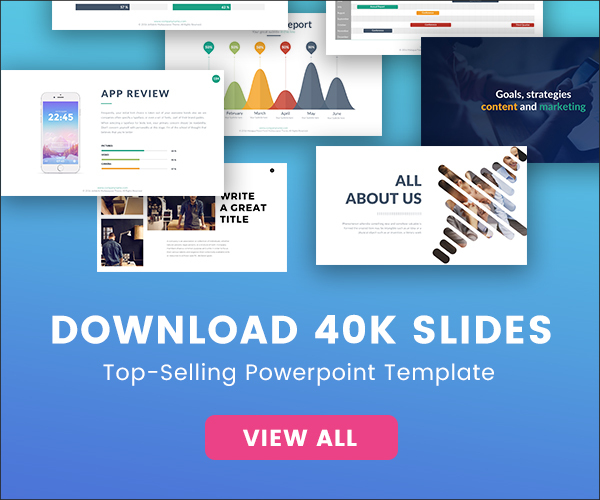 So, this presentation template will have everything you need to capture their attention, giving you a chance to convince them in a professional way. 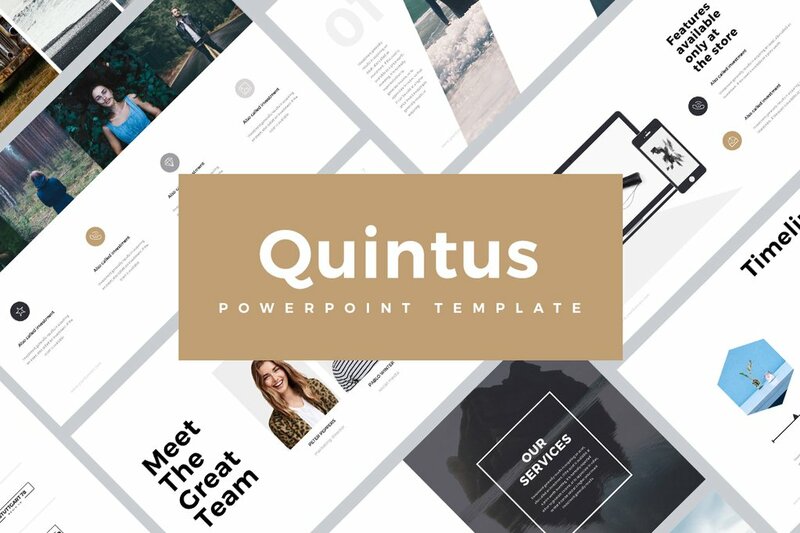 Quintus is a minimal style Powerpoint template that has an astonishing contemporary layout design. Your information will stand out giving your audience a clear message that is easy to follow along. This template is composed of more than 92 slides are have their own unique layout. 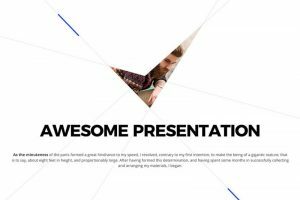 As a result, this presentation template is fully editable giving you full control to achieve giving a successful and powerful presentation to the audience. 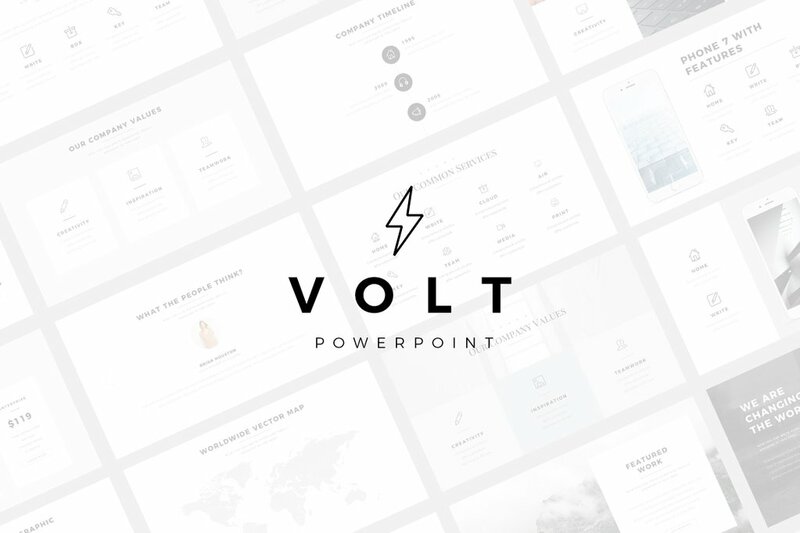 Simple and elegance never looked good in a Powerpoint presentation as it does when you use the Volt Aesthetic template. 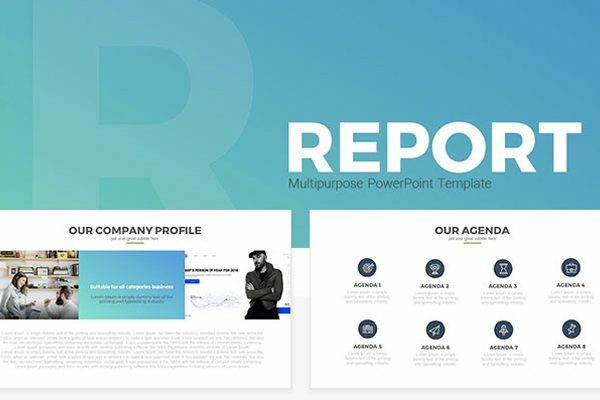 This presentation template is has a minimal style letting you get creative with the images, and visual aids such as infographics that you use. A visually appealing way to present data is by using tables, diagrams, maps, and many more elements to create an impressive presentation. Not only will you present your presentation in a great and powerful way, but you will also wow your audience with this simple Powerpoint presentation. 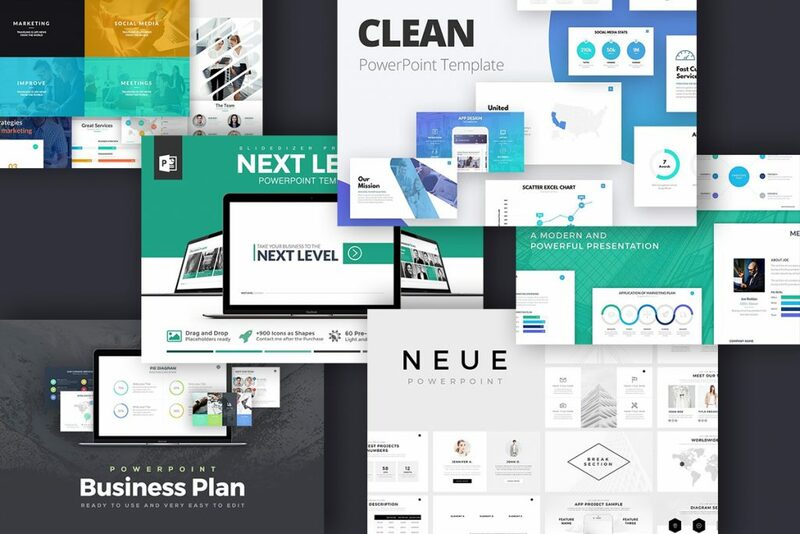 Wow, your audience of potential investors, clients, co-worker, or founders of the business you are representing with a sophisticated presentation template. 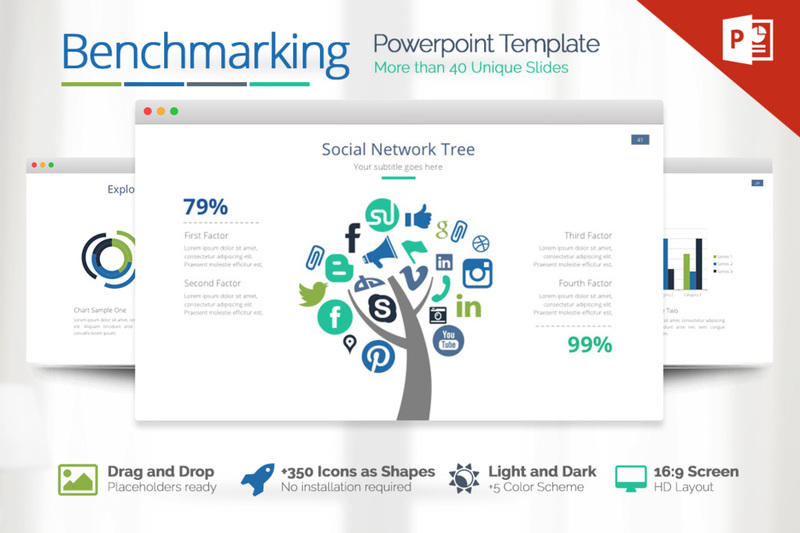 In fact, the Benchmarking Powerpoint Template is a powerful presentation template that will make your information stand out. 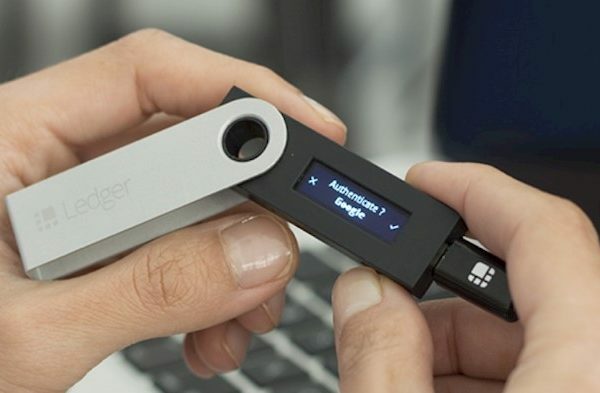 There are more than 40 slides for you to customize and add your information to create a unique and one of a kind presentation. Stay tuned because we will add more slides, so it will be easier to find the best Powerpoint templates for your next presentation.